Most of the time I think I'm a good Aunty. And then I hear myself speak. I caught the bus to work the other day. The same bus my eldest niece takes to school. In the space of 5 minutes I'd told her that Little Sissy Pham is an alcoholic (as a joke - the only person more sober than her is me) and that the bus wasn't packed as usual because adults slack off on Fridays (not a joke). These are just two of the multitude of things that spurt from my mouth without my brain's or Little Sissy Pham's approval. Lucky for my nieces, I'm not their only Aunty option. There's Little Sissy Pham and their mum's sister too. 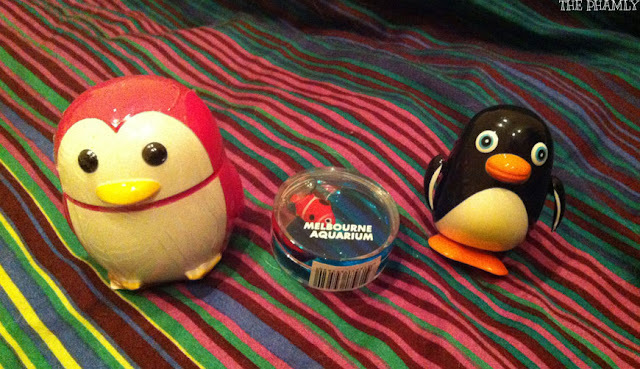 It's okay though, I make up for my personality with material things like these novelty penguin-shaped presents from Melbourne aquarium. Eldest niece got rose-scented hand cream and Middling niece got a waddling, wind-up penguin toy. I didn't get mini-bro anything because she can't understand language so I haven't damaged her outlook on life and don't owe her any quick-fix gifts. Yet.